People, no matter where they live, are the dominant force in protecting our natural resources. 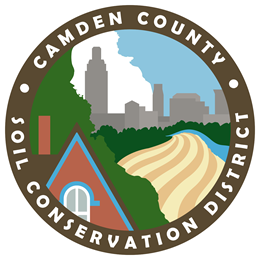 The Camden County Soil Conservation District (CCSCD) is a special purpose subdivision of the State serving Camden County. The CCSCD is one of 15 conservation districts in New Jersey empowered to conserve and manage soil and water resources in cooperation with the New Jersey Department of Agriculture State Soil Conservation Committee. We address soil erosion and sedimentation problems that result from land disturbance activities; stormwater; watershed planning and management; and provide educational outreach programs to schools, residents, municipalities, farmers and builders. The Camden County Soil Conservation District works closely with the New Jersey Conservation Partnership, a unique partnership linking the federal USDA Natural Resources Conservation Service, State Soil Conservation Committee, Rutgers University and New Jersey’s Soil Conservation Districts, on many statewide conservation initiatives. District Board of Supervisor's Meeting is held the 3rd Monday of each month at 6:30 pm at the District Office (unless otherwise indicated). The November 2018 meeting of the Camden County SCD Board of Supervisors has been rescheduled. The Board of Supervisors shall meet on November 19 at 3:30 pm. The meeting will be held at the Rutgers Eco-Complex (1200 Florence Columbus Rd, Bordentown, NJ 08505). Please note the change of location and time. The Camden County SCD provides the following financial data in an effort to be transparent in its fiduciary responsibilities. It is important to note that the Camden County SCD is fee-driven and is supported by the collection of plan review and project inspection fees paid by developers for construction projects. We receive no direct funding from Camden County or the State of New Jersey. Soil erosion and siltation has always been a part of a natural environmental process. The actions of man have accelerated this process through the use and misuse of land. As America grew, so did the demands on her bountiful resources. During the 1930's, the culmination of several factors caused the development of a severe erosion problem in the United States. These factors including overworking of the soil, poor land use practices and an extended period of drought, were the cause of the "Dust Bowl", a termed used to describe the huge storms that carried sediment from the Great Plains all the way to the east coast. One particular storm was so severe, dust was scattered on the decks of ships 200 miles out to sea and drove grit into the teeth of people in New York City! It also blotted out the sun in Washington, DC! During the 1930's over 100 million acres of farmland were destroyed. President Franklin Roosevelt signed the Soil Conservation Act in 1935, heralding the era of soil conservation in America. The President also called for states to implement this program by organizing soil conservation districts. To answer this call, the New Jersey Soil Conservation Act was adopted in 1937. One year later the Camburton Soil Conservation District was incorporated. At that time the district covered Burlington and Camden Counties and a few years later Ocean County joined the district. The Camburton District continued to operate until 1952, when the workload increased to the point where it was decided to separate into the Camden, Burlington, and Ocean County Soil Conservation Districts. The Camden District has evolved over the years to meet the challenges of an ever-changing society. While continuing to address the resource needs of agriculture, the soil conservation district expanded to meet the needs of an increasingly urbanized landscape. In the 1970's the districts were empowered to implement New Jersey Soil Erosion and Sediment Control Act, which includes the review of site plans for virtually all land disturbances associated with residential and commercial development, land grading, utility and public facility construction, gravel pits, mining operations and landfills. Today, in addition to enforcing the Soil Erosion and Sediment Control Act, the Camden District also works with numerous other organizations in conservation efforts, has a watershed management program and an educational program. There is a great educational program that educates the public and public officials, assists teachers, educates students and promotes conservation awareness. The New Jersey Envirothon and the Poster Contest are two exceptional programs that educate students in a fun and rewarding way. Some of the organizations the District works with include the Association of New Jersey Environmental Commissions (ANJEC), the Camden County Agriculture Development Board (CCAD), Camden County Open Space Trust Fund Board (CCOSTF), DEP Watershed Management Areas, and the South Jersey Builders League. Each of these organizations is important to environmental conservation in Camden County and the District strives to be integral part of the conservation effort in Camden County. Soil Conservation Act signed by President Franklin Roosevelt. The Camburton District is incorporated. The Camburton District was dissolved and Camden County Soil Conservation District was incorporated. A monthly radio program was started by the District Supervisors for soil and water conservation, it is no longer running. Official Soils Map of Camden County is last published. The District formally changed its number of District Supervisors from three members to five members. The Camden County SCD adopted the state's first Soil Erosion and Sediment Control Ordinance. The inception of the State Soil Erosion and Sediment Control Act (SESC), Chapter 251. First District employee was hired. The sixth edition of the Standards for Soil Erosion and Sediment Control in New Jersey is published. The District now has five full time employees. Scope of work includes enforcement of Chapter 251, watershed management and an education program.